It is a fact, universally acknowledged, that the level of allergies in children has risen hugely during the past decade – certainly within the Western world at least. The latest data from The Centers for Disease Control and Prevention in the US notes that between 1997-1999 and 2009- 2011, food allergy prevalence among children increased by 50 per cent. No one quite knows why, although there is speculation among scientists that children themselves, and the homes in which they live, are far too clean for their own good and that natural immunities are therefore not built up in the way they once were. There is little in the way of hard evidence to back up the theory because of the high cost and potential risks associated with conducting food challenges within large populations, but there is little in the way of argument from that basic premise. The key question has been: “How do we deal with the increase?” and until very recently the answer has been to recommend a delay in the introduction of allergens considered most likely to produce a reaction – that is, avoiding peanuts until after the age of three, for example. While in the US more than 170 foods have been reported to cause reactions, generally there are eight major allergens: milk, egg, peanut, tree nuts, wheat, soy, fish and crustacean shellfish – which are responsible for the majority of the allergic reactions in young children. However, the early avoidance strategy has not worked, indeed food allergies have continued to increase. The latest available figures disseminated by the US-based group FARE which supports those with food allergies, reports that results from a 2009-2010 survey of more than 38,000 children indicate that 5.9 million children in the US – equivalent to 8 per cent – have food allergies. Moreover, about 30% of children with a food allergy have multiple food allergies, this is more than one food to which they’re allergic. However, in February 2015 the scientific community’s view of how to best deal with allergies underwent a sea change with the publication of the Learning Early About Peanut Allergy (LEAP) study, which showed that the introduction of peanuts between 4-11 months of age in a high-risk population dramatically decreased the risk of developing peanut allergy compared to late introduction at five years of age. The findings were subsequently validated by further research and thus, while yet to be formalised, current thinking is that the early introduction of highly allergenic foods is likely to decrease the risk of developing a food allergy, see. This research is the inspiration behind the groundbreaking launch in the US baby food sector of the very aptly named Inspired Start – a range of fruit purees which are specifically designed to introduce the eight common food allergies to babies aged four months and over. Each pouch contains one gram of allergen protein, except for the banana and tree nut pouches, which contain one gram of each tree nut protein (almond, walnut and cashew) for a total of three grams. The ingredients are US Department of Agriculture-certified organic and non-genetically modified organisms, there is no sugar added and the popular pouch packaging is 100 per cent Bisphenol-A-free. There are eight flavours available, one for each allergen and each pouch costs less than US$3. 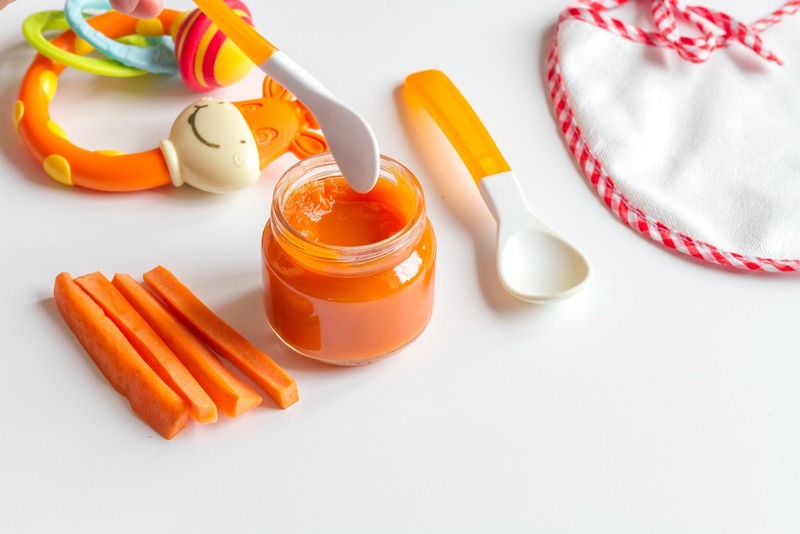 However, that is roughly twice as much as the most expensive mainstream organic pouches such as Ella’s Kitchen range from Hain Celestial, so it seems unlikely that the average parent is going to turn wholesale to feeding this range to their infant. But, even if it is just those most at risk (where there is a family history of allergies, for example) a potential 8% of a sector the size of the US baby meals represents a considerable amount. The reassurance and peace of mind the range offers for parents of food allergic children is worth its weight in gold.